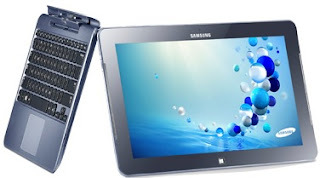 QA Tech-Tips: Review: Samsung's ATIV Smart PC 500TIs it worth the money? Recently I had an opportunity to take a peek at one of Samsung's newest tablets, the ATIV Smart PC, and frankly, I thought it was an interesting piece. 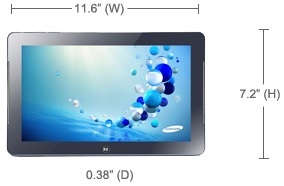 Looking at it, you are immediately aware of how this can function as both a tablet PC and a fairly good sized netbook. The version I messed with was the XE500T1C-HA1US model with a "64 gig" internal SSD hard drive, 2 gigs of internal system memory, 802.11 a/b/g/n Wireless connectivity. mini-HDMI, microSD, and a standard-sized headphone jack. The nice thing about this particular tablet is that it comes with the keyboard/docking station right out of the box - whereas with many tablets, the keyboard and/or dock is an extra-cost accessory. As tablets go, it's rather big - 11.6" x 7.2", and maybe just a tad more than a half-inch thick when it's closed on the keyboard. I have read other reviews who complain that the 12 x 7 form-factor is too big and clumsy. Of course, that all depends on what you're looking for in a tablet. If you want something that will run Android or iOS apps, surf the web, play tunes and videos, then maybe they're right. However, if you are looking for something a little more substantial - something with a big enough screen to let you actually see what you're doing, and actually do something useful, like word processing, e-mail, and other office-type apps, then this tablet might just be your man. One place where I can see something like this being really handy is in the "mobile office" scenario. Say you're a Real Estate agent, or someone who takes notes or fills out forms "on the road" - a tablet like this that's almost the size of a full sheet of paper could be really handy. The included accessories comprise the keyboard / dock, as well as a charging adapter which works with both American and European voltages. The power module has the (somewhat) standard triangular three-pin plug that allows you to find cords that will fit whatever sockets you may have to use. They are also thoughtful enough to include several, (five! ), extra pen tips for their S-Pen, and a small metal removal tool that makes changing the plastic tips reasonably simple. Even though they supply five extra tips, each of which is reversible, the tips themselves look to be quite rugged. With five extras, you will outgrow the tablet long before you use up the pen's tips. That is unless you chew them, or drag them on concrete. Before I go on to tell you what I think about this beast, I want to make a very substantial caveat: This tablet shipped with Windows 8 installed, which, as I have already said, is an absolute PIG of an operating system. There were performance issues that may not have had anything at all to do with the underlying hardware, such as sluggish response at times, or choppy video. I could not compare this system with Windows 8 installed to anything else as Microsoft's SecureBoot mandate makes it literally impossible to use this hardware with any other operating system, even if it's on a bootable CD. I want to place this right out on the table, up front, since I have had similar issues with installations of Windows Vista - another ill-conceived operating system - even on hardware that was known to be rock-solid with performance to burn. I would like to suggest that you take the performance issues raised in this review with a pretty large chunk of salt. That is, until it is possible to review this with some other operating system. It runs the Windows operating system, which means that the majority of the apps that you will need to use, will slide right in with 'nary a squeak. It's big. The screen is big, bright, and easy to work with. Just as important in my opinion, the screen is large enough so that you can see what you're doing. Even if your eyes aren't exactly twenty years old anymore. The touch features are clever and interesting. Though you can use your fingers for many tasks, you will probably want to keep the included "S-Pen" in your pocket as well. One nice feature is that when you get the pen close to the screen, a small target-like cursor pops up showing you where the screen thinks you're pointing - damn handy if you ask me. Likewise, on the side of the pen is a small plastic hinged button of sorts that - when pressed - displays a circle around the target that's easy to see, indicating that you are about to right-click instead of left-click. Also pretty darn handy. The included keyboard, though a bit small by laptop standards, is still a comfortable size and even my fat fingers had no trouble using it. Attaching the tablet screen to the keyboard is accomplished by two hook-clips in the keyboard's track where the tablet docks. When they snap in, it's a nice solid attachment. Likewise, once docked, the "dock" part of the keyboard is hinged so you can close it like a laptop. It has one USB slot on the "top" of the tablet, along with a micro-SD card slot and - depending on model - there is also a place where you can slip in a GSM SIM card for broadband internet access. On the left side, there's a small (ahem!) HDMI port, though I am not sure that this little beast would be my choice as a source of HDMI video. The keyboard also adds two extra USB ports, so if you want an external hard drive, or a mouse, attached to the keyboard dock, you can set it up and just leave it that way. It comes with Windows 8 - which as I discussed in a previous article - isn't exactly the operating system I'd want to see on a PC - though to be honest, I have no idea how you'd use Win-7 on a tablet either. It's big. It won't fit into a pocketbook or pocket - if you want to tote it around you will probably want some kind of a cover or netbook bag for it. Though the keyboard latches tightly to the tablet when docked - you have to be really careful about how well it has snapped into place. On a few occasions, after I thought I had a good solid attachment, I discovered that only one of the two hook-latches had engaged. There is a little button just below the center of the tablet's screen on the keyboard's dock that releases the tablet. I found it a bit clumsy to use, often struggling to get the tablet undocked, worrying if I was grabbing the tablet hard enough to damage the screen when trying to separate the two pieces. Though the keyboard dock is clever and useful, the combination touch-pad and button is absolutely awful - there is only one button, which you press by pushing down on the touch-pad itself. Trying to right-click with the touch-pad involves a somewhat complicated two-finger move while pressing the touch pad to engage the button. Recommendation: Get yourself a wireless mouse that has the teeny-tiny dongle that barely pokes out the side and use that. Also, unless you are a lot more coordinated than I am, you will probably want to turn off tapping as well. I found it way too easy to inadvertently move the mouse cursor and select things just by typing if my palm brushed the touch-pad. The dual-core 32 bit Atom processor is powerful enough for most every-day tasks, but I'd save the heavy lifting for something more substantial. In my case, I had some trouble using the pen and touch features. This may not be the fault of the tablet, as anyone that has enough of a tremor that they can rent themselves out as a paint-shaker, isn't the best candidate for something that requires a modicum of eye-hand coordination. However I was a bit disappointed; after all Microsoft's posturing about "accessibility" they didn't include some kind of anti-tremor feature. Of course, even Ubuntu Linux doesn't have that, and I'm pretty darn sure that Apple isn't paying too much attention to those of us with unsteady hands either. It comes with Microsoft's newest abomination - SecureBoot - which makes any kind of modification or update to the system pretty much impossible. Though I will admit that this isn't Samsung's fault, as Microsoft has mandated certain very specific requirements to tablet manufacturers before they can ship Windows 8. The Microsoft mandated features of the EFI bios makes it virtually impossible to boot using external media. I tried booting with a bootable USB thumb-drive as well as an external CD drive, and though both were detected during boot-up, (I could tell by the way the lights flashed that it obviously had mounted the device and read from it), the EFI bios refused to list them as potential boot sources and would not touch them. Maybe it only works if they are properly SecureBoot blessed? I don't know, but I do know that I could not boot anything I had externally, even with SecureBoot marked as "disabled" in the bios itself. Ergo, if you decide you want to transform this into a hot-smokin' Linux tablet - fuggeddaboutit. It's a nice piece and I can see how it could be pretty darn useful, especially in a student or mobile-office scenario, but it's no laptop. The fact that it comes with a docking keyboard that - in essence - turns it into a "convertible" tablet / netbook system, is one of it's strongest points. It has plenty of USB ports, and if you need more than the 32 gigs of drive space left over after Windows 8 claims the first half, you can use either external USB drives, or slip a microSD card into it to add an additional on-board drive to store stuff in. I should also note that they have other versions of this tablet that include larger amounts of SSD storage, and perhaps other interesting features built in. Since the model I reviewed only came with wireless internet capability, it wasn't the best choice for watching streaming video, as on my local wireless network the video I streamed to it was a bit choppy at times. Though I will qualify that statement by saying that I had similar problems with Windows Vista - even on a hard-wired network connection - so it may not be the tablet's fault. Again, there are other models that include hard-wired Gigabit LAN connectivity if that's something you want. The fact that it has an Atom processor - even though it's dual core - it still seems a bit under-powered at times. Though - another caveat is that this will be strongly influenced by what you want to do with it, and again this may be due to Windows 8 instead of the hardware. The list price of $750 may not endear it to many people either - especially since a bit of judicious web-sniffing brings up alternatives for much less money. Prior to writing this review, I made a quick web-search looking for other Windows 8 tablets, and it wasn't long before I found a strong contender from Acer - another brand I like - in their W510-1422 Tablet - that has virtually identical specs to the Samsung, including screen size and keyboard, for $600. And this is from Acer's own on-line store. You might be able to find it cheaper at other reputable on-line retailers like Amazon or B&H.